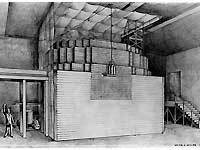 Early exploration nuclear reactors designed by the Manhattan Project's Metallurgical Laboratory, the direct predecessor to Argonne National Laboratory, began the development of nuclear technology. This drawing depicts the historic Dec. 2, 1942, event -- the first controlled, self-sustaining nuclear chain reaction. It took place under the abandoned football stands at the University of Chicago. Click on photo to view a larger image. 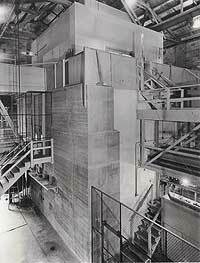 Chicago Pile 1 was the world's first nuclear reactor, built in 1942 by Nobel Prize winner Enrico Fermi. The reactor was built underneath the University of Chicago's Stagg Field football stadium. 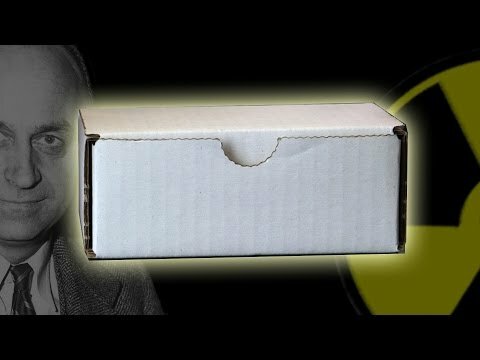 On Dec. 2, 1942, Enrico Fermi and 48 of his colleagues succeed in achieving in this reactor the world’s first man-made controlled nuclear chain reaction, thereby establishing the ability of mankind to control the release of nuclear energy. He and other scientists from that group later founded Argonne National Laboratory. 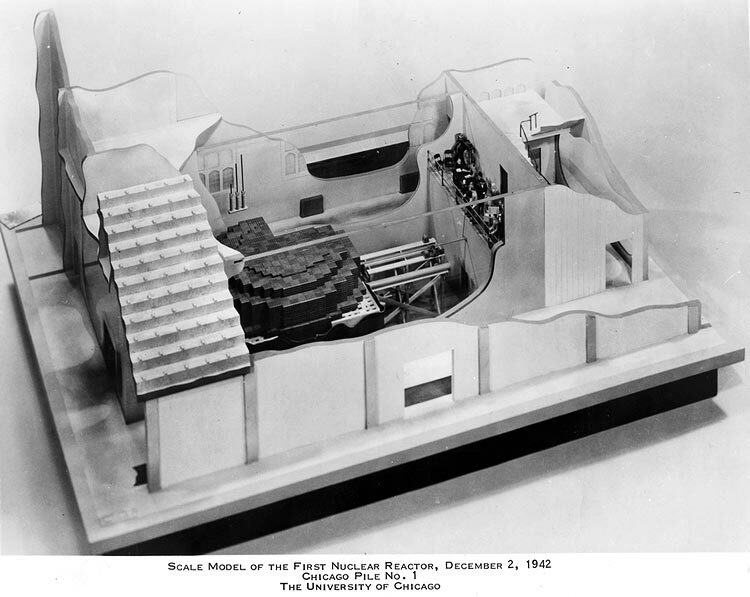 Scale model of CP-1 reactor. Courtesy Archival Photographic Files, [apf2-00504], Special Collections Research Center, University of Chicago Library. 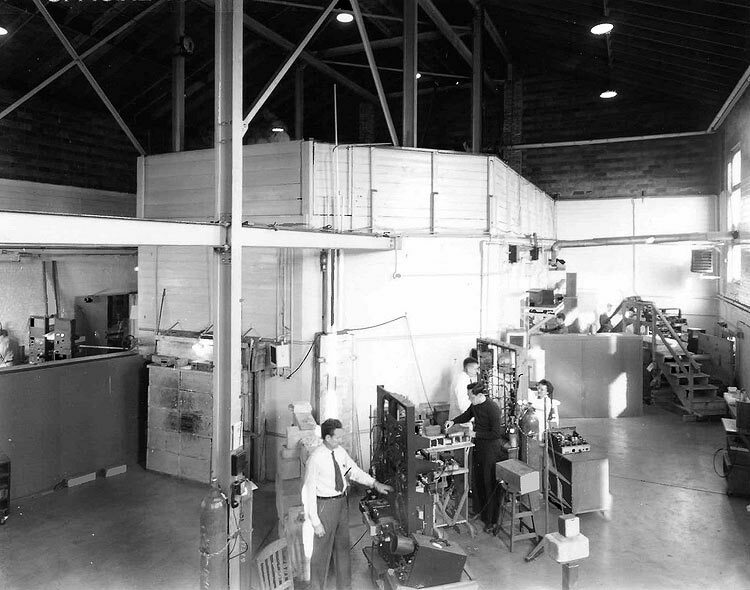 The photograph at right shows a scale model depicting Fermi’s reactor setup on that day in 1942. The model shows a segment of the football stadium and gives a perspective on where the reactor was located under the stands. Fermi and his colleagues were assembled on the balcony to the right to observe the instruments recording the neutron intensity in the pile. 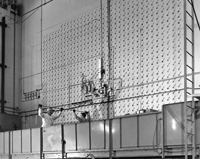 After the reactor had sustained the chain reaction for 28 minutes the operators to the right of the reactor (in the left foreground of the photo) pushed in a cadmium control rod called zip, which absorbed neutrons and ended the chain reaction. The reactor fuel was lumps of uranium metal and uranium oxide; these were spaced on a cubic lattice within layers of graphite, with some graphite layers containing only uranium metal pseudospheres, some only uranium oxide pseudospheres, and some containing both. The pile was built by alternating graphite layers seeded with uranium metal and/or uranium oxide with layers of solid graphite blocks. The completed reactor contained 57 layers, which was about one layer beyond the critical stage needed to sustain the chain reaction. Early in 1943, CP-1 was dismantled and moved to a less-populated site in the "Argonne Forest" section of the Cook County Forest Preserve in Palos Park. That part of the forest has since been renamed, but its appellation survives today in the name of Argonne National Laboratory. 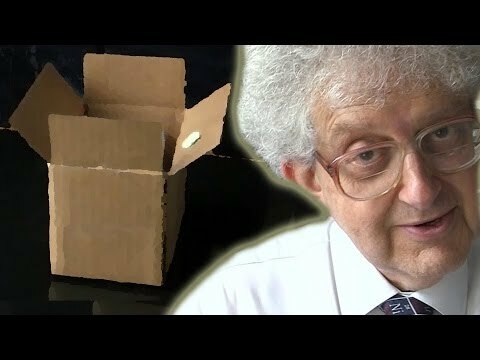 Acclaimed British Chemist Martyn Poliakoff, CBE FRS, talks about a very special piece of graphite given to the Rt. Hon. David Willetts, the United Kingdom's Minister for Universities and Science, during a February 2014 visit to Argonne National Laboratory. A surprise gift for Prof. Martyn Poliakoff from across the pond. In early 1943, Chicago Pile 1 was dismantled at the University of Chicago, moved to the Argonne Forest section of the Palos Hills Forest Preserve, and renamed Chicago Pile 2. Click on photo to view a larger image. In early 1943 Manhattan Engineer District disassembled Chicago Pile 1 and rebuilt it at Palos Park, IL, as Chicago Pile 2. CP-2 normally operated at about 1 kW, but occasionally went as high as 10 kW (thermal). The fuel for CP-2 was natural uranium (uranium in which the natural abundance of the isotopes uranium-234, uranium-235, and uranium-238 has not been altered). 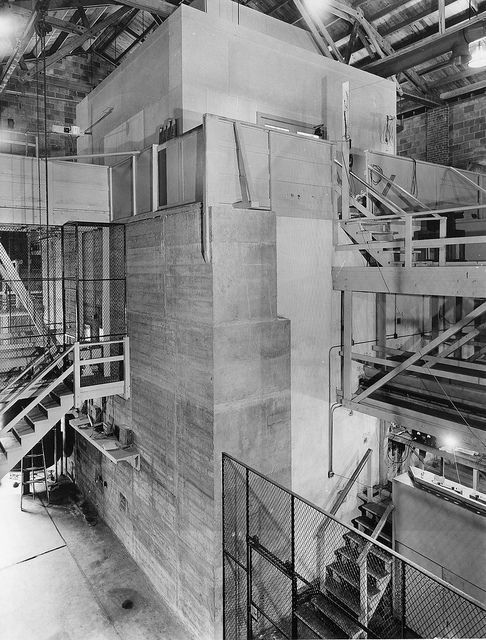 A small laboratory atop the 14,000-ton reactor provided space for limited experiments using neutrons from the reactor's core. 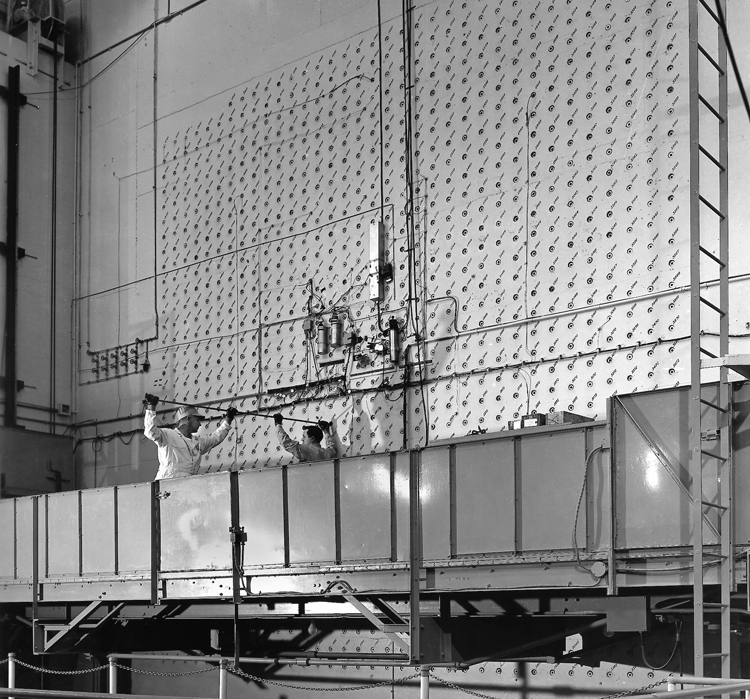 The reactor's face contained ports through which materials could be inserted into the core for irradiation. CP-2 was shut down in 1954. ANL-NT-175 (April, 2001) [5.8MB] — Report featuring detailed descriptions of all the ZPR-6 assemblies, also contains an extensive bibliography of technical reports that detail the results of all the experiments on ZPR-6. History of MET Lab Section C-I, April 1942--April 1943 [40MB], by Glenn T. Seaborg, February 01, 1977 — This is a report assembled in the 1970’s by Glenn Seaborg on his work at the Met Lab in the April 1942 to April 1943 period. See page 201 of the report for his personal account of how Plutonium was isolated by the microchemists at the Met Lab. The Chicago Pile-3 reactor. Click on photo to view a larger image. 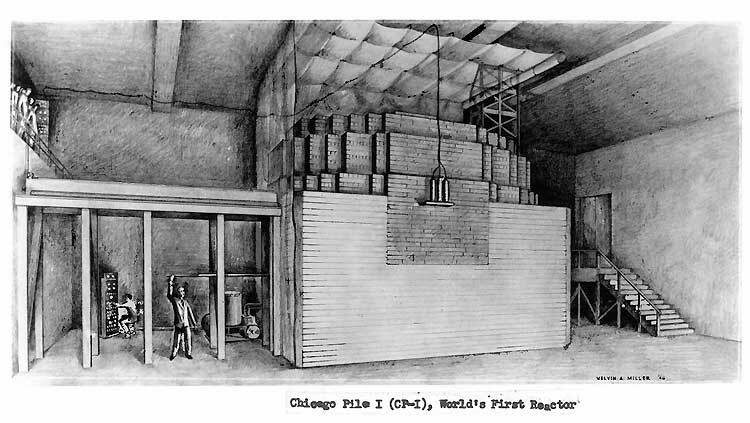 Chicago Pile 3 was the world's first "heavy-water moderated" reactor. It was designed by Eugene Wigner; at Enrico Fermi's request, Walter Zinn directed its construction in the Argonne Forest in 1943. Chicago Pile 3 achieved criticality in 1944. The fuel was, as in the case of the CP-2 reactor, natural uranium. CP-3 was dismantled in January 1950 because of suspected corrosion of the aluminum cladding around some of the fuel rods. The natural uranium fuel in CP-3 was replaced with enriched uranium (uranium in which the amount of uranium-235 in the fuel has been increased from its naturally occurring abundance). The redesigned reactor, named CP-3’ ("CP-3 prime"), became operational in May 1950. CP-3’ shut down in 1954. CP-3 was shared with the Canadians, who used it in the design of the Canadian NRX reactor, from which the 27 CANDU commercial power reactors evolved. 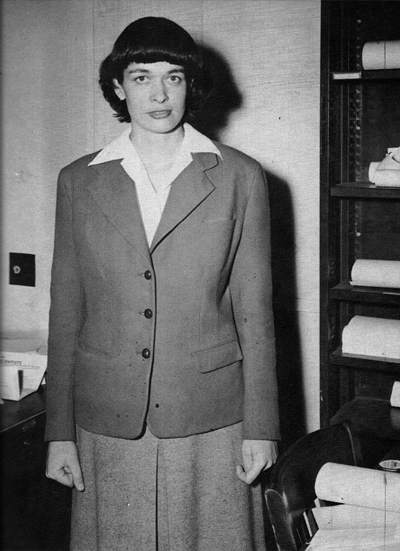 Research programs conducted at CP-3 and CP-3’ included reactor physics studies, fission product separations, tritium recovery from irradiated lithium, and studies of radionuclide metabolism in laboratory animals. The X-10 reactor. Click on photo to view a larger image. To be the prototype for the Hanford plutonium production reactor. It demonstrated that the Hanford reactor could be water-cooled without absorbing too many neutrons to function as a production reactor. To produce enough plutonium for research on separating plutonium from uranium in time for the startup of the Hanford production reactor. To provide experience for reactor operators, engineers, and others who were then transferred to Hanford. To verify the bismuth-phosphate plutonium separation chemical process to be used at Hanford. X-10 was fueled with natural uranium, its neutrons moderated with graphite, and its heat removed by air blowers. It generated up to 4 megawatts of thermal power. It operated from 1943 to 1963. 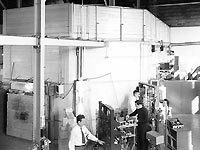 The first post-war research reactor in the US, the Brookhaven National Laboratory Graphite Research Reactor, was modelled after X-10. It pioneered the production of medical isotopes (molybdenum-99, technetium-99m) that comprise a large fraction of medical isotopes used today. It also produced I-131, P-32, and C-14 for scientific, medical, industrial, and agricultural uses. British scientists and engineers used the X-10 experience to begin work on the UK’s dual-purpose gas-cooled Magnox electricity-generating reactors.